Motto: "Med Gud for Danmark." With God for Denmark. Marriage: 24. May, 1935 to Princess Ingrid of Sweden. Throne passed to: Margrethe II. 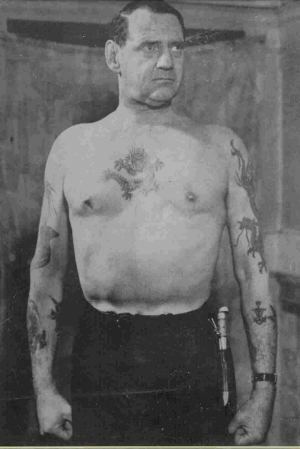 Frederik IX was a former sailor, and had plenty of tattoos. He also very much enjoyed music, and particularly liked to conduct music. Born on the 11 of March 1899. Parents: King Christian X and Queen Alexandrine (née Duchess of Mecklenburg-Schwerin). Married on the 24 of May 1935 to Princess Ingrid of Sweden. Daughters: Margrethe II, Benedikte, Anne-Marie. Frederik IX was a naval officer and he was also very interested in music. Since he had no sons, the throne should upon his death have been inherited by his brother, Prince Knud. However, in 1953, the Act of Succession was changed, allowing females to become Queen Regnants. Frederik IX died on the 14 of January 1972 and was succeeded by his daughter Margrethe II. Queen Ingrid, born as a princess of Sweden, was the only daughter of our king Gustav VI Adolf and his first wife Margareth of Connaught. Ingrid had two older brothers, Gustav Adolf and Sigvard, and two younger brothers, Bertil and Carl Johan. Gustav Adolf was supposed to become king after their father, but he died in a plane crash, which was even three years before his grandfather Gustav V died. But his son is our current king Carl XVI Gustaf. Queen Ingrid was thus Carl Gustaf's aunt, which makes Margarethe and her sisters his cousins. Ingrid and Frederik were third cousins. They shared two common great grandparents, King Oscar I and Queen Josephine of Sweden. One question, where should I post the pics of KFIX and QI together? So, does anybody know how many tattoos this sailor King had? And where and what they portrayed? A pity that my computer crashed a while ago, as I had saved an engagement picture of Frederik Princess Olga of Greece (later Pss Paul of Yougoslavia). I believe Olga broke off the engagement because Frederik was overly fond of alcohol. I have seen a picture of the king without his shirt on next to Queen Ingrid, I believe, and he was fairly covered in tattoos - while she was fully dressed. Quite the contrast. Wasn't there something about religion also in that particular break-up? I thought that Olga being Greek-Orthodox didn't want to convert to the Lutheran faith? Perhaps that is the Danish version, protective of your own King et all. And it might have played a role, but thus far the only thing that I have heard is that Olga couldn't or didnt want to handle frederiks fondness of alcohol. I believe he was found rather rough too (hard to imagine when you see pictures of him with his daughters btw). Frederik IX tatttoos were on the traditional side. The black Chinese Tang dragon symbolized power and protection. His other tattoos include: the Jerusalem Cross on his arm, another dragon on the opposite arm, another dragon below the elbow on his left arm, an anchor, a sparrow, the Danish family crest, and another tattoo that I can't really make out. It's interesting to see that the King loved dragons so much that he decided to have three done. Not all dragons are considered as protection. Some can mean the opposite, which is why it is so important for people to research the design before having it inked onto your skin. You don't want to regret it and it hurts more to have it lasered off than being inked. Trust me, I know. Other royals that had tattoos: King Alfonso of Spain, King Alexander of Yugoslavia, King George V of Britian, King Harold of Britian, King Henry VI of Britian, King Edward VII of Britian, King George II of Greece, Czar Nicholas II. Another thing that I find interesting is the tattoo fad in the late 19th century. Many royals as well as aristocrats were eager to get tattooed. Many went to Japan to seek out the famous artist, Hori Chiyo, whose traditional method of tebori is still practiced by the famous tattooer Horiyosi in Japan. The book Sømandskongen (The Sailor King) by Jon Bloch Skipper, alludes to a sea-journey Frederik, his brother Knud, and his cousins, Prince Axel and Princess Margrethe took to the far east, representing Denmark. the journey started in January 1930. They visited China, Siam & Japan, and when Frederik returned to Denmark: he had tattoos that he showed off for his officer-coworkers. This might explain the dragons. Regarding his broken engagement, Marengo, the book mentions that the official reason given, was that Princess Olga didn't want to convert to the Lutheran faith. The private reason, given in private letters, was that she couldn't get used to his "sailor-manners". Queen Margrethe implies that the couple might simply not have been mature enough to get married, (Frederik was 23 at the time, Olga 18-19), although Olga got married the year after to Paul of Yugoslavia. From what I understand, Frederik's dragon tattoos were done by George Burchett not by Hori Chiyo or his apprentices or from any other tattooer from Asia. Perhaps I'll see if I can find the book, The Sailor King by Jon Bloch Skipper, and read his claims. I wouldn't trust that website when it comes to accuracy about tattoos. The photo is great, but after reading their claims about other specific tattoos I found many mistakes. If you take a look closely at some of his other work you can tell it was not done in the traditional style. Hence, not done in Asia because many artists did not start using the gun until the mid-sixties. George Burchett is known, not only as one of Europe's finest, but his perference for the gun. Also, if you notice one of dragons is facing down (the head) Bad luck. Japanese and other artistis from Asia would never tattoo a dragon with their head down. It must always face up. This could be an intresting little hunt: To find out who orginally designed Frederik IX's art, how was it done (meaning gun or tebori), are they flat or detailed, why the Jerusalem cross, and why did he feel the need to have so many dragons? And, how long did each take, when, where, why, and did he complete each in a short amount of time or where they done over the course of several years. what kind of marriage did Ingrid and Fredrick have? He seemed quite a few years older than her and much more gruff, like the drunken dailor type! Do any of you Danes have an answer? Was it an arranged marriage, and did Ingrid have no choice? I have never heard rumours of an arranged marriage (or that Frederik IX did not have a choice... ....). By all accounts, Frederik IX was a very devoted father to his girls and from many pictures of him and Ingrid, I always thought he simply adored Ingrid. I actually thought the same, the King was very dedicated to his Swedish wife. But the marriage was arranged for sure, or a better term might be that they were 'helped' and perhaps pushed into a certain direction when it became evident that they had taken a liking for each other. We should also remember, that Ingrid was among the few protestant princesses in whole Europe in that generation. She had a lot of choices and offerings. If she wouldn't have liked Frederik, she could have married almost any other protestant prince in Europe. So she seems to at least have chosen him over any other (protestant) prince.